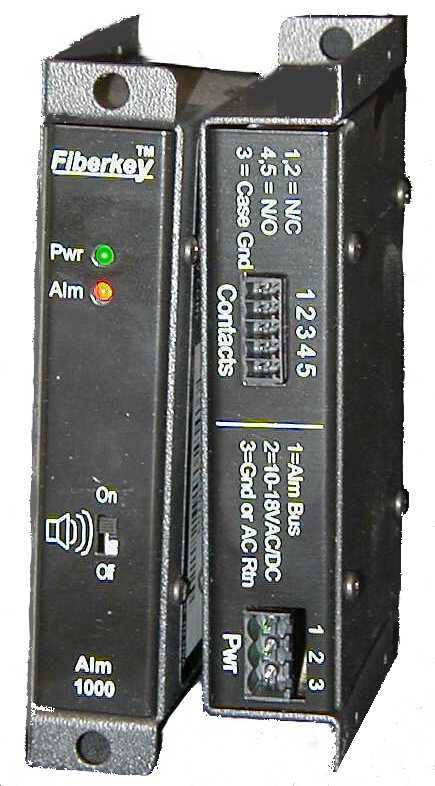 The Luxlink® ALM-1000 provides an indication of an alarm condition that occurs in any Luxlink® fiber optic transmission module to which it is connected. When an alarm condition is sensed, a red indicator LED on the unit begins to blink and an audible beeper begins to sound. In addition, a set of SPDT contacts are activated for the operation of a remote device. The ALM-1000 may be used to detect the loss of a signal, or to detect the occurrence of a broken fiber depending on the module it is connected to. The unit may be used in either a stand-alone mode or mounted to any of the RMP series of rack mounting panels. Physical Size (mm) 5.0” x 3.0 x 1.0"
* Red Alarm LED and Remote Alarm Contacts cannot be turned off.